Infographinomicon: More Maps. More Mayhem. More M-words. More Maps. More Mayhem. More M-words. Deck the streets with coreflute posters, the campaign has officially started. Without delay, here is the continuation of our mapstravaganza. Firstly, we ignore any elections prior to 1938, since the multi-candidate nature of seats prior to this provides incomparable data. Secondly, where seats have had multiple incarnations, we consider only the most recent incarnation's results. Thirdly, where a seat has its names changed, data from the previously-named seat is also included. 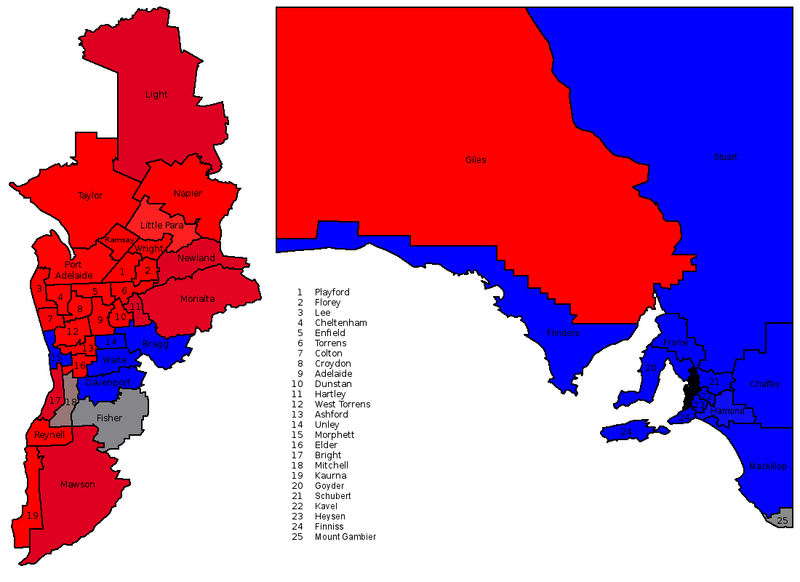 Finally, red indicates SA Labor seats, grey is independent and blue indicates current Coalition parties (Liberal and Nationals) and precursors to these (Liberal and Country League and Liberal Movement). The Liberal Movement is counted as Coalition, even though a small segment broke away to form the New Liberal Movement and eventually joined the Democrats. Affiliated Independents (e.g. Independent Liberals) are treated as independents since they are often running against incumbent representatives of their affiliated parties. The Single Tax League is also counted as independent. Last week we took two maps of averaged history – one averaged since 1938 and the other averaged for the last 5 elections. Exactly how far back the averages go before they are cut off is an often arbitrary choice. These next maps, however, avoid this issue by weighting more recent elections' results as more valuable predictors of future patterns. This eliminates the problem of arbitrary cut-offs without diluting more recent results. However, it is important to realise that the weighting system is equally subjective in regards to how heavily the weighting should affect the results. Lighter coloured electorates have a shorter history and thus more white from the background. ALP is the SA Labor Party, Co is the combined Coalition parties (and forebears) and IND is independent. 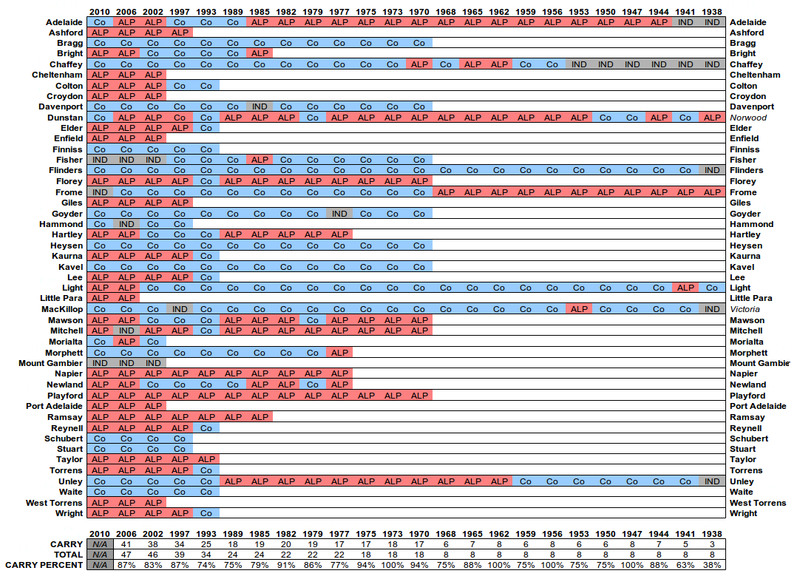 This table shows the voting history of each seat as per the colouring used in our maps (slightly faded to increase legibility). Normally I would leave this table for the data dump, but it is convenient to discuss it here. Firstly, we can see that the majority of current seats were in place by 1993, hence the 5-election cut-off last post. This is a value we will return to later. 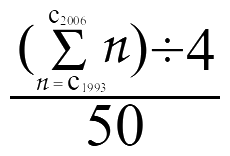 Secondly, we can see the calculations conducted below. For our VDTA's we want the opacity of each election to reflect the predictive strength of its results. For simplicity, we will only consider the seats still on the electoral map, and we calculate the predictive strength of each election by how reflective it was of the following results. For example, of the eight seats from 1938 still in use, five changed hands in 1941. This means three were retained (the 'carry' figure). This gives a 3/8 predictive strength for this election (or a 'carry percent' value of 38%). Note that 2010 has no predictive value as that requires comparison with the 2014 results. As a result this map is a little out-dated in that it does not incorporate the most recent results. Firstly, here is a map where the layers' opacity is equivalent to the carry percent. As a result, data only dates back to 1973 where a 100% opacity obscures any earlier data. With these high opacities, new layers readily obscure old. With low opacities, however, we quickly reach a position where no year exerts a significant influence on the data, and the wash-out effect is so low as to effectively serve as a seat average. Data derived from the federal map last year suggest that a contribution of 5% or more of the colour is distinguishable to the human eye, if we take my eye as the type specimen of a human eye and accept that I am, in fact, the definitive example of a human being. Oddly the scientific establishment seems reluctant to accept that I am the standard against which all other people should be measured, but we'll carry on with this self-evident truth until they come to their senses. 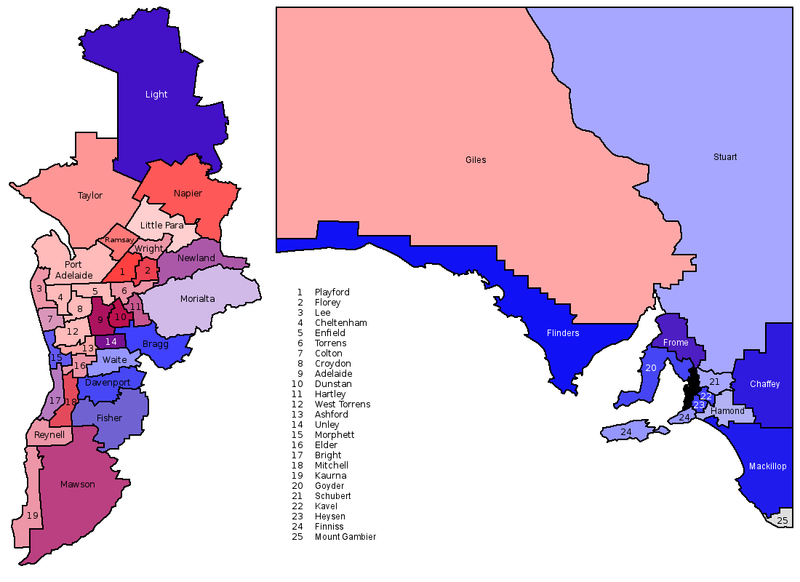 We must also accept that the arbitrarily scaled federal map is indicative of our current map (and all maps) coloured in this way, although initial evidence suggests it is easier to observe colour differences in larger seats. Taking 5% colour change as the definition of a seat being meaningfully included, we calculated that roughly 10% average opacity (as used in the CTA above) gives a good approximation of the maximum number of influencing layers (7 layers – almost 8). The arbitrary decision to aim for this maximum inclusion was hastily made, and the opacity of each layer was divided by a figure intended to result in 10% average opacity across the top 7 layers. It is still undetermined exactly how many layers should be included for best results, but lets this time aim for 4 layers of influence. This will put the majority of the influence on the elections from 1993 onwards and, as we pointed out earlier and last post, 1993 was the election at which the vast majority of current seats were first present. Make what you will of that until tomorrow (when I will make of them what I will). All the Candidates. All the time.